While the current weather forecast is promising our first hint of spring for Saturday's ride, please be mindful that black ice conditions may exist, especially in the early morning hours. With the snow melting during the day and the runoff getting splashed across the road, some spots may ice over during the evening hours. Also, there is still plenty of loose gravel and grit on the road -- be sure to watch out for this hazard, especially on the corners. 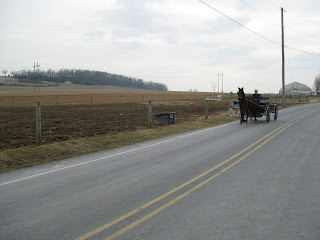 Enjoy a scenic ride around Lancaster County, but don't count on a day of entirely gentle terrain. Starting in Ephrata, we'll warm up on the rolling terrain as we make our way toward Annville climbing over the Cornwall Ridge along the way. From Annville, the course follows a southerly track filled with more Pennsylvania rollers as it meanders toward the Susquehanna River. A quick control in Bainbridge provides an opportunity to refill water bottles in preparation for a down river run. Riders will enjoy long stretches of flat roads peppered with a few short climbs, especially as we draw closer to the lunch control in Conestoga. Eat well as the next leg features a seemingly endless array of sawtooth climbs guaranteed to burn a few calories. Two quick controles in Atglen and Compass mark the eastern end of our route as we turn and head for the final leg home. One final climb over the Welsh Mountain then it's all downhill from there. And a bunch of the other regular riders will probably be clipping in as well. If you do plan to ride also, please send Andrew a note. A reminder to those of you who have not yet renewed your Pa Randonneurs membership for 2010: please renew now or talk with Tom before the event. Past brevet starts show that it's all I can do to get everyone signed in and ready to ride by the start time. A good place for breakfast is The Pancake Farm, just north of the K-Mart along Rt. 272. Given the riding conditions of our recent events, you'll want to start with a full tank. I will be there when they open (5:15) if you want to join me. I should be at the K-Mart parking lot by 6:15 to get a head start on sign-ins. .... please let me know of any corrections or other issues. I'll be submitting the results shortly, and they will then become final pending RUSA validation. Although this event was originally scheduled as an ACP event, it is now officially a RUSA event due to the rescheduling. So we'll have a few less points going to the U.S.A. for the PBP11 nation cap. And the event cannot go towards an SR award. However, there are still plenty of other ACP 200k events on the calendar this year! Special thanks to the preride volunteers: Don Jagel, Bill Olsen, and Len Zawodniak. They made sure the cuesheet was as good as it could be, and made sure the course was safe for the rest of us. Bill and Len really took one for the team -- their ride in late January was quite cold, with temperatures in the low teens when they clipped in. And of note, Don Jagel recorded the fastest course time out on his own. After 3 postponements, it was good to finally get this event in. Although there were a couple of areas with black ice early on, the weather finally cooperated and gave us a spectacular day for riding with plenty of sun and temperatures in the 40F's. There were 11 official finishers out of 12 starters. First-time rider Steve Hanes was riding very strongly when I met up with him at the halfway point. However some navigation problems ultimately prevented him from officially finishing. Despite that, Steve was happy to get in 120 miles and came away with some good lessons learned for next time. And speaking of lessons learned, I seem to always learn something new as well on each ride -- or rather, **re-learning** some painful lesson that needed a refresher course. About half way through the ride, I started having breathing problems -- the cold, dry air was irritating my lungs. I was finding it increasingly difficult to take a deep breath without a coughing fit. I had the same problem on the January ride, and even commented afterwards about how Andrew Mead had effectively averted this. In mentioning my issue to Shane Beake, he just pointed to his balaclava, which he had pulled up over his mouth. Well, I had one of those too ... and by doing the same, my ride got a whole lot better. The warm-moist air through the balaclava was much more effective than the handful of cough drops I had been using up to that point -- Thanks Shane! The course featured 2 major climbs. That apparently just was not challenging enough for local randonneur, and Road Bike Rider editor Ed Pavelka. At mile 110, he mistakenly turned right onto Stillwater Rd instead of the left marked on the cuesheet. And after 2 miles, instead of finding the controle in Stillwater, Ed found himself at the top of a long, steep climb -- the recorded profile he sent me shows that it was about as high (and much steeper) as the other 2 major climbs. Ed probably would've been the first finisher, if he hadn't opted for that third major climb. At any rate, it's good to have him clipping-in with us again, and he is clearly returning back to the great form he had in 2007 before his injury. While riding with Roy Yates, he mentioned a sore knee that he was nursing along. One of the best resources I've found to help deal with all the aches and pains is "Andy Pruitt's Medical Guide for Cyclist". This guide is available on-line as an e-book... highly recommended. First finisher (and fixed-gear rider) Guy Harris comment: "...Great early season ride and very fixed friendly. The off season riding is great around the Newton-Swartswood Lake area..." If you have any other comments, ride reports or pictures to share, you can post them on the message board or you can forward them to me for posting. Next up, is Andrew Mead's Spring Forward 200k in just about 2 weeks. This is a fantastic course that takes us through the Lancaster area ... drop him note if you plan to ride. While several of us have earned our first R-12 award, and may be working on our second, we have a new "first" for the PA R-12 series, a Tandem R-12. Completing December's snowy PA-200K, Barb and Ron Anderson (Team Purple Burley) earned their Tandem R12 Awards - all qualifying rides were together on their tandem! Ron and Barb began randonneuring in 2007, completing several 200Ks, a 400K and a 600K, all on their tandem, the Purple Burley. They were Tandem SRs in 2008 and again in 2009, and although they've had some challenging 400 and 600K's, they admitted that they are most proud of their Tandem R-12 medals. Barb and Ron are also charter members of the DSSTRS, the Double Super Secret Tandem Rando Society. Although it it a secret, feel free to contact them for membership requirements. With the completion of a permanent in January, Barb and Ron are on their way towards their second Tandem R-12. With the relatively quiet weather and the sun doing it's thing the past few days, it looks like we can finally get this event off this coming Saturday, Feb 20. The current forecast looks very promising, with plenty of sun and temperatures that might even see the 40F's. Don Jagel completed a volunteer preride on Thursday (2/18) to check out the course conditions. Don reports "...The cue sheet was excellent (as usual). This is a very good winter course because the navigation is simple on roads that are well maintained for the most part. As you mentioned, the ride was pretty sheltered from the wind. I did experience a bit of a headwind on Rt. 612 and on Halsey Road, but it wasn't any big deal. When I got home today I checked the records from my weather station and we had winds in Germansville between 10 and 20 mph throughout the day with several gusts well over 30 mph (oh yeah, the road in front of my house was drifted shut again when I got home). I certainly didn't experience anything like that on my ride. The road conditions were very good throughout the ride. River Road just north of Milford, in the Narrows Section, was pretty narrow, but not much different than it normally is without any snow around. The only slush I saw in the road was on Tunnel Road at the Rt. 78 underpass. It was a very small amount in the right side of the right hand lane, and I would be surprised if that is still there by Saturday. Also, the last tunnel on Rt. 94 was wet and could potentially by slick in freezing temperatures. The only other issue was the amount of anti-skid gravel/salt spread on the roads that could make things a little sketchy at intersections, but that is normal for this time of year...."
Don also pointed out that there are better controle options in Milford than the Citgo (which is currently listed on the cuesheet). Don writes: ".... I don't know if you have ever been into the Milford Market which is located on Bridge Street immediately across from the Church Street - Bridge Street intersection. They usually have good coffee and a selection of other good stuff, and their prices are better than the Citgo. It might be an option since the Milford Baker closed...." Good suggestion Don! With this in mind, the controle in Milford is an "open controle" ... you may either stop at the Citgo (as listed on the cuesheet) or the any of the other stores/restaurants on Bridge St. Please remember to park your car in the Park N' Ride parking lot, not the diner parking lot. And if you're planning to ride and not listed below, drop me a note. Due to icy road conditions from the recent storm, the event is postponed again and rescheduled for Saturday, February 20. Since there is yet more snow in the forecast next week, be sure to monitor the message board for any additional updates. Due to the major winter storm that is headed our way on Tuesday and expected to last into Wednesday, the event is postponed again and rescheduled for Sunday, February 14. Andrew Mead will be doing a volunteer preride on Saturday to check out the road conditions for us -- be sure to check the message board for any last minute updates, in case the roads prove to be unsafe. Due to winter storm that is headed our way on Friday and expected to last into Saturday, the event is postponed and rescheduled for Saturday, February 13. Please note that since there is limited parking at the start/finish Portland Diner, park your car at the nearby Park n' Ride -- directions are posted here. The start/finish diner is a short 0.3 mile bike ride from the parking area. And please note: the weather forecast is calling for a possible winter storm by the end of the week ... be sure to check back on the website for any last-minute postponement announcements. Event details for the upcoming Stillwater 200k on Feb 6 have been posted. This is part of the on-going R-12 series and a current membership is needed in order to participate. Existing members may renew when they sign-in -- please note that I need a new waiver signed for 2010. With the prospect of winter road conditions, the Stillwater200k is mostly upon open, main roads. The course is a brand new route that includes some new roads I scouted out late last fall in the Stillwater area -- this area is north of Blairstown and east of the Delaware Water Gap Recreation Area. We'll eventually travel through the namesake's town and stop at a quaint general store there. Nearby, we'll also see plenty of still water, as we pass through the Swartswood recreation area with it's large lake and many ponds. We'll start out from the Portland Diner, where you can top-off for breakfast before you start. We'll follow the Delaware River south, upon familiar roads all the way down to Milford. Unfortunately, the Milford Bakery is closed -- one of my all-time favorite stops. But we'll have a controle stop at a very nice bakery in Phillipsburg. We'll then head up what appears to be a major climb on the course profile, as we travel up Sweet Hollow Road from Little York into Asbury. But the gradient is mostly gentle, and the nice stream along the climb is a good distraction from the effort of going up. At Asbury, we once again ride upon some familiar roads in reverse. Using parts of the 2009 PA300k and Dark Moon 200k, we ride along the Musconetcong River into Port Murray and then up over the ridge into Great Meadows. From Great Meadows, we once again join the Dark Moon course in reverse as we head north of Sparta into the controle at Lafayette. From there, we head west and south into the Stillwater area and on through Blairstown and back across the pedestrian bridge to Portland. And a bunch of the other regular riders will probably be clipping in as well. If you do plan to ride also, please send me a note. Please check back on this link for any updates or changes.